I am a big fan of no-churn ice creams because they are easy to put together and require no special equipment. 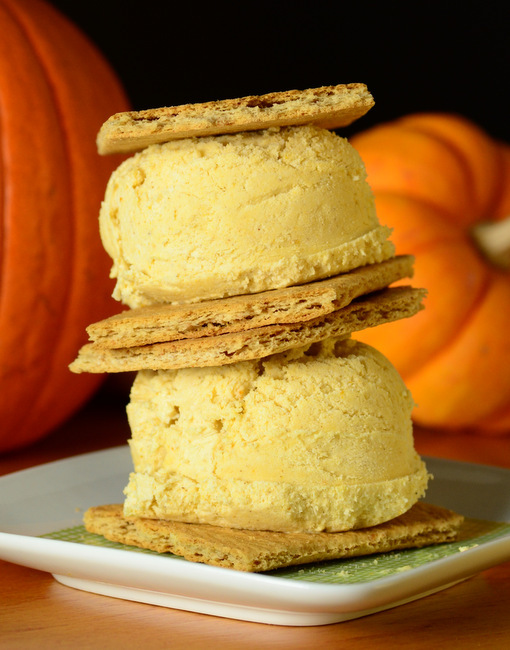 This No Churn Pumpkin Pie Ice Cream is a refreshing twist on pumpkin pie, with a mousse-like ice cream that packs in all the familiar flavors of pumpkin pie in a completely new way. Most no churn ice creams start with sweetened condensed milk, which brings in all the sugar and richness you need to give you ice cream a velvety mouthfeel. This recipe starts with a homemade pumpkin pie filling mixture. The base is made with pumpkin pie, brown sugar and spices, and it is thickened with an egg, just like pie filling. The base is cooked on the stovetop until it thickens, giving it a true pumpkin pie flavor. It is folded into whipped cream, which aerates the ice cream without having to use an ice cream maker, and frozen until it is firm enough to scoop. The ice cream is sandwiched between graham cracker squares to make the ice cream sandwiches. You can use any kind of honey grahams, but the cinnamon-topped variety are particularly tasty. The ice cream needs to freeze hard enough that it is easy to scoop, but you will probably have to let it soften a bit after the sandwiches are made so that you can easily bite into them. Fortunately, the scoops will soften in a couple of minutes once the sandwiches are set up. I recommend making these shortly before serving, as the graham crackers will lose a little of their crispness if they are stored in the freezer for an extended period of time. That being said, they can certainly be in the freezer for a little while, so you can assemble these before dinner and bring them out after the main meal without a problem. In a medium bowl, whisk together pumpkin puree, brown sugar, egg, spices, vanilla, salt and milk until smooth. Transfer to a large skillet or small saucepan and cook over medium heat, stirring continuously, until the mixture thickens to the consistency of pudding. This should take no more than 5 minutes. Allow pumpkin mixture to cool to room temperature. In a large bowl, beat heavy cream to soft peaks. Fold in pumpkin mixture until completely incorporated. Transfer to a shallow pan and freeze until firm enough to scoop, at least 2 hours. Break large graham crackers into squares. Place 1 scoop between each pair of graham cracker squares. Serve immediately, or freeze until ready to serve.